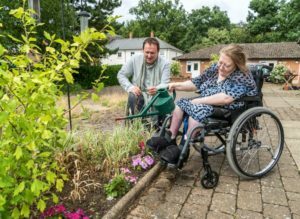 Award-winning garden designer, BBC TV presenter and garden writer Mark Lane is teaming up with disability charity Leonard Cheshire to promote the benefits of gardening for health and well-being as part of its partnership with the National Garden Scheme. In 2018 the National Garden Scheme made Leonard Cheshire one of its Gardens and Health beneficiaries, with a donation of £120,000 to develop sensory gardens and horticultural volunteering projects for disabled people across the UK. Mark, who is a passionate advocate of gardening for disabled people, is supporting Leonard Cheshire on its mission to showcase the therapeutic benefits of gardens. He will design one of the sensory gardens at Leonard Cheshire’s care home in Bedfordshire. He is working with the charity to produce a short film about how gardening can be universally inclusive, with practical tips and inspiration. 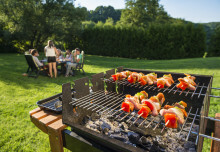 In it, he explains how gardens and gardening can offer an immeasurable sense of wellbeing, both physically and mentally and highlights that no matter what level of ability you have there is a gardening task that you can do. It will be released during the National Garden Scheme’s Gardens and Health Week (August 18 to 24). Mark said: “Gardens that are fully accessible help bring communities together, help tackle isolation but above all are great fun and incredible for both mental and physical wellbeing. It’s also easy to garden on a budget, even for free. And if I can do it, so can you. Leonard Cheshire executive director of partnerships Laura Crandley said: “We’re very excited about our partnership with the National Garden Scheme, which is enabling us to bring the benefits of gardens and gardening closer to the people we support. The National Garden Scheme chief executive George Plumptre added: “We are proud to be funding the very important work Leonard Cheshire are doing to help the individuals they support to live, learn and work independently, demonstrating the universal impact gardening can have.